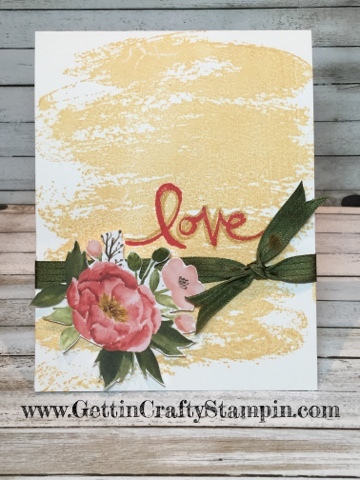 This love watercolor hand-stamped card was a recent card making class favorite! Super easy, pretty and perfectly accented with sparkle. Deliver smiles with a pretty hand-crafted card. Have fun while joining us to create your own collection of hand-made cards at our card making classes (in-person or to-go class options - taking the class anywhere in the world!). Create a pretty water color look with NO Water-coloring!! 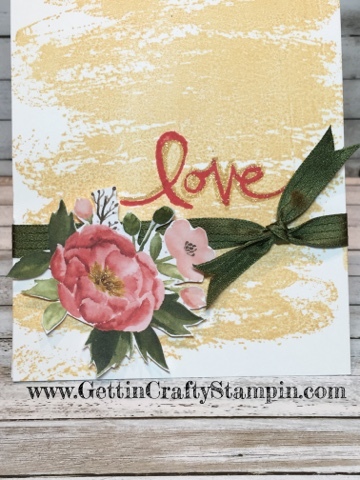 Using this new Water Color Wash background stamp and the So Saffron ink pad on the Thick Whisper White card stock. It creates a pretty soft look. Stamp the Watercolor Words photopolymer saying in the In-Color Watermelon Wonder ink pad. Accented with the pretty Gold Wink of Stella on the pretty 'love' and the center of the cut flower. Tool Tip Tuesday: Photopolymer stamps need extra care. They do not bounce like rubber stamps (clear or wood mounted) do. Add the Stampin' Pierce Pad (126199) under all projects that use these type stamps. I use it UNDER my grid paper (130148) in case I stamp outside of the paper. The stunning water color looking flower comes from the Birthday Bouquet Designer Series Paper (from the Occasions Mini Catalog). Use the precision Paper Snips (103579) to easily cut these pretty images. Adhere on the card over this in-color Mossy Meadow ribbon using the Stampin' Dimensional adhesive for added depth. At our recent Valentine's / Love Crafternoon - this card isn't the typical Valentine but is sure to deliver sparkles and smiles to those who see it. A mock water-color look - all three elements look but aren't actual water color techniques - how fun is that? Join Us and create and send love to those in your life wrapped up in a pretty hand-stamped card.